how do you set this up on a mac? Great! Make Google Reader app please! What about instructions for Chrome for OSX? In Ubuntu found them in /opt/google/chrome/resources (or in /path/to/chrome/resources). I guess on OSx should be in the installation folder as well (/resources if exists). OK, found the apps to unpack, but still don't know how to enter the command line mod for apps to be enabled in OSX ... anybody? ok dumb question, but i cant get my chrome to version 6.0.458.1... the dev download page only has version 5.something.... how do i upgrade it? Any way to get these to open pinned on Chrome startup? I've tried pinning them and setting my startup option to "open the following pages" with the pinned tabs and other tabs listed. However, they open unpinned (normal tabs) at next startup. @Brozufil are you sure you got a dev build? I hope that Firefox will eventually implement this sort of thing. As well, I'm uncomfortable with this so long as it is just a Google technology. @trufagus App tabs are part of the redesign plan for Firefox 4 (already partially enabled in the nightly builds). "To install a web app, you need to write a small Chrome extension that includes..."
"To _create_ a web app..."
This was one of those interesting Chrome features demoed and Google I|O that I liked, specially for Gmail's app. Google said the Chrome App Store would be opened later this year. So not possible on Chrome OS just yet then? @Jonathan Frederickson As far as I know, you have been able to do this on Chromium OS. Pretty awesome. 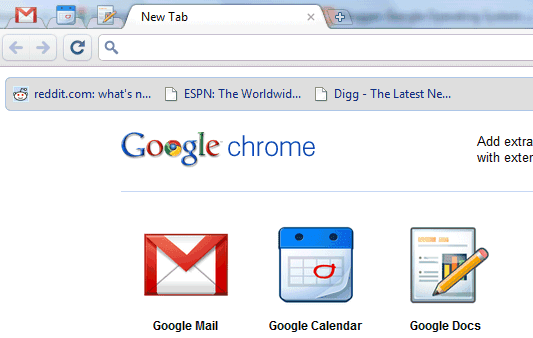 I definitely love the new tab icons and removal of the toolbar. It might be nice, however, if a simple alt+d could bring it down . . . now if they'd just bring back phantom tabs as well! @Brozufil. I could be mistaken, but it looks like right clicking the icon and selecting "pin tab" works for me. That was a good improvement, it works great for my personal gmail account but I would like to make it work also with my google apps account. Can anyone hepl me?? I suggest some improvement of GMail Web App. At first sight you can not see (if GMail tab is not active) if you have any unread mails waiting to be read. So my suggestion is to change icon of red M to something like blue M, if you have any unread mails. Second thing, you can not see (if GMail tab is not active) if there is someone want to chat with you. So I suggest to do some significant animation around red/blue M icon. Awesome! I just realized this. I like it in theory, but I'm not so sure on how it's currently implemented. I hope they bring back "application shortcuts" as I would, and do, currently use this feature allot more than the new application tabs. Not sure about how they've implemented them in the "start" page as well. Looks a bit messy, I like my recently opened pages at the top! Good to see innovation though, keep up the good work Google! Search for it in another %USERPROFILE% folder. You can quite easily create a copy of the gmail_app (or others) to make them use your own domain's google apps. It just takes a few changes to URLs. @Cougar Abogado - oh, sorry. But even I'm not using the phantom tabs again, the apps-tab still appeared. [Tested with reopening the Chrome a couple times]. Against Brozufil's problem. Maybe there's something wrong with his Chrome's data. @David Figueres - Good app extensions! But will be necesary that gmail app extension indicate a number of unread emails. In Ubuntu, Chrome 6.458.1 doen's show tabs for these apps. There is any extra configuration to do? I'm on Windows XP and I can't get this to work at all. I've got --enable-apps after the target, and all three apps are unpacked into extensions, but whenever I start Chrome, I just get the normal screen. @Ryan. Did you click on them in the "New Tab" page? They have to be initiated there, for some reason. Looks exactly like a pinned tab in Chrome. How is this any different? @Cougar_Abogado. Thanks - literally just found that out. You also need to pin them to keep them there. @Ryan. Glad to hear it worked. Yeah, along with pinning them, I wish they'd bring back making them phantom tabs . . . I've got the latest Chrome Beta, but I do not have these folders anywhere, under any user profiles. Any suggestions? @benci007. You need the dev channel version, not the beta. @benci007. I could have misunderstood Alex, but when he said, "If you use Google Chrome Dev Channel or a recent Chromium build, you can install 3 Google apps . . ." I think he implied that it won't work on either the beta or stable channel. I've now got them working, however, on pinning them so that they're there when I re-open Chrome, they lose their new application icons - they revert to normal pinned tabs. 'C:\Users\MyName\AppData\Local\Google\Chrome\Application\6.0.458.1\Resources\reader_app.' Manifest file is missing or unreadable." However, I did have to create a maps_app folder in the resources folder and then save the three files to it. Sorry I don't have a .crx! @Nicholas. Actually, your .crx probably works just fine, I finally realized I have to drag the file into the Chrome window for it to work . . . I can't find local settings in user account? Can't find it anywhere actually, I wonder what happened to it? thank you for this, but i am still wating for alot of chrome,s apps. its really just a way for google to push its in-house apps..
An icon for the "Chrome Web Store" is now showing up for me, but it just links to the Extensions page at the moment. @Michael @Cougar Where do you see the link? Oh, never mind. I see it now. The icon looks like a Google colored cube with a triangle inside (or something) and says "Chrome Web St..." (for me). Mac users, here are some links to help you get started if you're not as familiar with command line args in the Mac world. In Step 2 above, you are provided a solution to run Chrome using a command prompt. Not sure about you but I prefer my day to day routine of clicking on the Chrome icon from the dock (or better yet the app auto started on startup). If so, check out the link below. Warning: this may have some side effects as the author points out but none as far as I can see for the casual everyday user. In Step 3 above, in Mac OSX you need to navigate to Applications. From there find "Google Chrome", right click and choose "Show Package Contents". The app folders are located in "Resources\gmail_app" and so on. Since you won't be able to access this folder when installing from the Chrome browser you need to copy these folders to another location that is accessible. I recommend "\Library\Application Support\Google\Chrome\". Create a Resources folder and throw the web app folders in there. You can then access and install these "unpacked extensions". @Panit everything worked for me except for step 2. how can i enable apps on chrome for mac? When would this be available in the normal builds of Google Chrome browser? Using OSX: Have got the apps installed (they show up in my Extension page) but the icons do not show up in the "New Tab" page at all. Any ideas what I'm doing wrong? you can either do it through command line with "open /Applications/Google\ Chrome.app --args -enable-apps"
I had to disable speed dial (awesome extension btw) in order to see the apps in the new tab page. once i got the apps installed and pinned to my liking i then enabled speed dial again. i'm guessing you have speed dial or a similar extension which overrides the default new tab page. give it a shot. I'm running Chrome 6.0.490.1 dev in Windows 7. I do not have a folder: %USERPROFILE%\AppData\Local\Google\Chrome\Application. Why? In the Chrome-folder I only have a folder called "User data". I'm running Chrome Dev and Canary builds and though apps install, they just act as normal pinned tabs with better icons. I still have the omnibox and the tabs look the same. I've tried it on several updates already, but it just isn't working right. Does anyone know how to make it work? Like I said, they install just fine, so it must be some kind of a glitch. i am running the new chrome 7. somn dev version and i dont have that folder either, could they have taken it out? or am i just not looking in the right place? @ seye you may want to download one of the recent dev chrome v7 installs, as I was having the same problem with the v6..
Google's web apps doesn't work with Google's Apps for your domain. Any idea on how to get this to work or are we left out in the cold as usual. I was able to edit the manifest file so now GAFYAD works now. On a different note, I notice the apps are not opening like they did on the previous version of chrome. Like the previous guy said, tabstrips. It worked last week I swear. so, does this thing still work? I have 9.0.597.0 dev version of chrome, and I can't get any of: gmail_app, calendar_app, docs_app folders in Resources folder? I found it pretty explanatory. On the other hand, at the end of the day, I think the current default apps are essentially pinned tabs with big icons on the new tab page . . . I hope that will change back to actual "app tab" functionality, when the web store opens (or sooner).